RadialMenu with 8 buttons per menu. Each button on RadialMenu can link to a submenu. Customizable Toolbar with up to 40 rows x 40 columns of buttons. 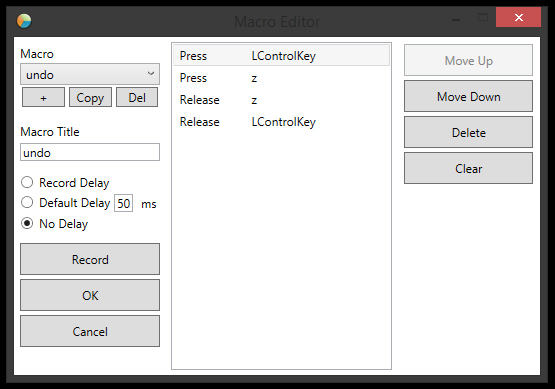 Built in macro editor and recorder. Custom per-application profiles and automatic profile switching for both RadialMenu and the Toolbar. Execute custom macros, launch programs, open folders and send key presses. Change the size of RadialMenu/Toolbar to suit your tastes. RadialMenu is customizable, change the border color, border size, hover border color, background, text, text color, and icon displayed for buttons. Color settings are per-menu specific. Custom button shape options for RadialMenu including Wedge, Triangle, Web, Circle, Square, Rounded Square, and Octagon. Changing the RadialMenu button colors to transparent allows only the icon to be displayed allowing the icon itself to be the button. Built in Swipe gesture activation of RadialMenu for quick access to the menu's buttons. DoubleClick activation option for those with a single pen button. lblb and his work on Toolbar Creator and it's contributors for inspiration for the visual design of the toolbar addition to RadialMenu. And last but not least, the TabletPCReview community. Without a community like this one I may have never started down the Tablet/Slate PC path so many years ago. - Added: Toolbar: Check for touch input that should fix some issues where input was still being processed when the toolbar wasn't visible. - Fixed: RadialMenu 'Gesture' mode activation command execution was executing the command 180 degrees from the chosen button. - Fixed: Double activation of "Launch/Run" command. - Fixed: Crash on profile export when trying to overwrite a previously exported profile. - Fixed: Toolbar showing itself when using "Stylus Auto Hide" and the toolbar is minimized from using the rollup/minimize button. - Fixed: Missing icons/images when using "Launch At Startup"
If any problems are encountered I suggest moving/backing up your existing settings and then starting RadialMenu. Doing this will reset RadialMenu to it's default install state. Settings are located at "C:\Users\COMPUTERNAME\AppData\Local\RadialMenu". The entire folder can be moved or deleted and RadialMenu will generate a new one as well as a new settings file. RadialMenu runs as a tray icon, right clicking the icon in the system tray will bring up a menu enabling access to the settings dialog as well as the option to exit the application. With a fresh install RadialMenu will have the default menu that is used for all applications that aren't associated with a specific profile, initially no buttons will be visible as they are NOT preset to an action but are disabled. Disabled buttons won't appear on the live menu at all. Once in the settings dialog RadialMenu and the Toolbar will be in 'Designer Mode' where you can customize the menus, buttons, and create/edit application profiles. Right click on a button to access it's settings. This works the same in both RadialMenu and the Toolbar. By default RadialMenu can be activated by pressing CONTROL + SHIFT + Z or CONTROL + MIDDLE MOUSE BUTTON. This can be changed in the settings/options window. Note that after changing the activation hotkey you have to exit/restart radialmenu for it to take effect. Checking the 'DoubleClick' button will cause RadialMenu to activate when the chosen mouse button is double clicked. 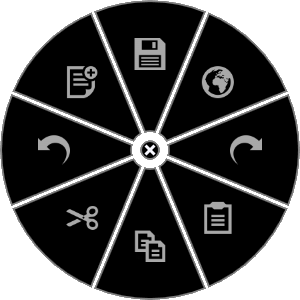 The Toolbar has a button exclusively for toggling radial menu. Right clicking on the button brings up the options/settings menu. If you click the 'Navigational flicks and editing flicks' radio button you can customize what they do. You can use existing commands, or custom hotkeys. RadialMenu already will intercept these keys if you set your Keyboard Trigger in RadialMenu to the same thing as the flick. For example, the 'Print' flick command will send 'Ctrl + P' as a backup appcommand. If RadialMenus' keyboard trigger is set to 'Ctrl + P' then that flick will show radial menu. 1. Activate radialmenu away from your right click target, then right click your target while radial menu is still displayed. 2. Right click "through" radial menu if you are accurate enough to do it in the space between the buttons. 3. Hold down control or shift and then right click your target. Utan-chan, Starlight5, Gary.M and 5 others like this. Looks awesome! I can't wait! I just discovered your Radial Menu last night and I've been playing around with it a lot. It's awesome! Thanks so much! I hope microsoft eventually adds functionality for customising the pen buttons on the surface pro 3, so that I can trigger it just with the pen. Do you think you could add the ability to rearrange the buttons on the toolbar? And also allow them to keep their positions if new rows or columns are added? Is this the same member that issued the other Radial Menu? Dude! Clint man, you're insane! Can't wait to test it out! I should be able to set that up already, i'll see what I can find out. If anyone wants to send me a surface for uh, 'development reasons' I'm more then happy to accept it. This release changes quite a few things. If any problems are encountered I suggest moving/backing up your existing settings and then starting RadialMenu. Doing this will reset RadialMenu to it's default install state. Settings are located at "C:\Users\COMPUTERNAME\AppData\Local\RadialMenu". The entire folder can be moved or deleted and RadialMenu will generate a new one as well as a new settings file. - Fixed: Disabled toolbar buttons are now hidden by default. - Added: Several options for RadialMenu mouse activation; Gesture(press mouse button down to show radial menu, then drag to target button and release to activate the button's command), DoubleClick, and Normal. - Changed: When activating RadialMenu from the Toolbar icon RadialMenu will appear centered on the mouse. - Fixed: Ability to hide RadialMenu by using the assigned trigger, previously it did nothing when RadialMenu was already visible. - Changed: RadialMenu options UI cleaned up. - Updated to the latest version of WPF Toolkit. - Fixed: RadialMenu will reposition itself to the center of the screen when entering design mode when RadialMenu is already visible. - Added: Ability to change the size of RadialMenu. - Added: More shape options for RadialMenu buttons. - Fixed: Toolbar: Resolved an issue when the UI buttons are on the bottom with a toolbar size other then 1 where the toolbar would change position whenever the toolbar was rolled up. - Fixed: RadialMenu: Colors of the center button now match the toolbar. - Added: Ability to change the size of the image displayed on the RadialMenu buttons. - Updated icon settings, changed folder structure some. Now the default icons used in RadialMenu/Toolbar are located in the "Images" folder where RadialMenu is installed. - Added: RadialMenu: Option to change the hover border color of buttons. - Changed build options to target more platforms. - Fixed: App switching with 64 bit applicaitons. Works on my test system. - Changed keyboard trigger to not repeat. That's really crazy... Started using it more and more and with your fix for x64 app it's gonna be perfect. Touch gesture/input support is something I'd like to add eventually.